With summer here it's time to get out and exercise. Or appear to, anyway. It all starts with the right look, and 6pm.com is here for you. 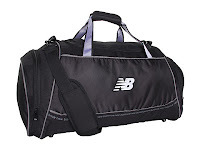 Right now they are discounting hundreds of popular New Balance athletic shoes, apparel, and accessories. Save up to 70% and get free shipping on all orders! You can sort by size, gender, age, and whatever else to find the right fit. Boy, can I use a new gym bag. Mine smells like feet. Click here to view the offers at 6pm.com.